It can take HOURS for wine to decant and "breathe." Why wait when you can uncover your wine's hidden qualities with a push of a button? Taste luxurious, full-bodied wine the right way with the Waerator Instant Wine Aerator! Drink and enjoy your favorite wine at home with family, on a romantic date, or at a party with friends. This wine tool's compact design and satin finish allow you to comfortably aerate wine anywhere. Precisely pour wine into your glass with the specially designed spout, which provides 1.2 oz of aerated wine every 2 sec. No spills! No stains! The Waerator 's airtight rubber seal even keeps your wine fresher longer while you drink. 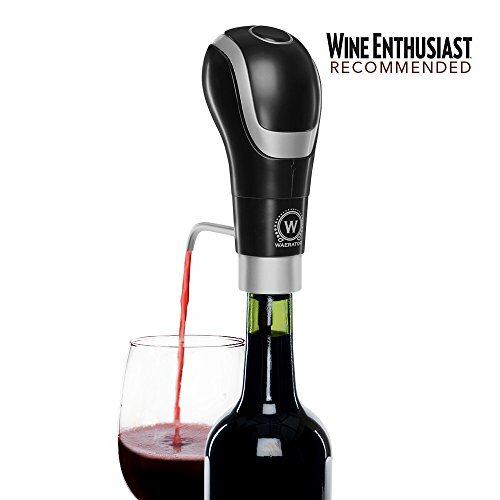 With the electric aerator, you will no longer waste your favorite wines! Not only is this wine pourer easy to use, it is also effortless to maintain! Fill an empty bottle of wine with clean water, insert the Waerator, and press the button until the bottle empties. Repeat this at least 3 times, and you're done. It's THAT simple! Don't settle for JUST wine. Drink better, bolder, flavorful wine. Experience wine's true,unparalleled aroma and taste with the Waerator, the best wine aerator. SIMPLE 1-BUTTON AERATION - Aerate and oxidize with one button to soften tannins and enrich your wine for luxurious taste. ESSENTIAL FOR WINE LOVERS - Pair with red wines, select white wines, & fresh/aged wines to create fireworks of flavor. NO SPILLS OR SEDIMENT - With the dual infusion & suction system, draw wine without sediments & pour precisely from the spout. KEEPS WINE FRESH LONGER - This wine accessory features an airtight rubber seal, so your wines remain fresh while you drink. EFFORTLESS MAINTENANCE - With just the push of a button, draw clean water through the aerator wine for easy maintenance. If you have any questions about this product by WAERATOR, contact us by completing and submitting the form below. If you are looking for a specif part number, please include it with your message.